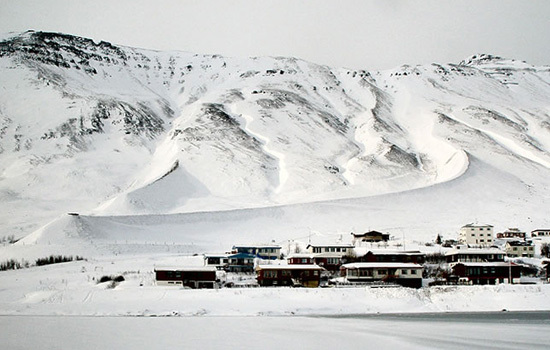 Inscribed on that liminal space where civilization messily interfaces with the wilderness is a series of monumental earthworks protecting the Icelandic town of Siglufjörður from snow avalanches and landslides. 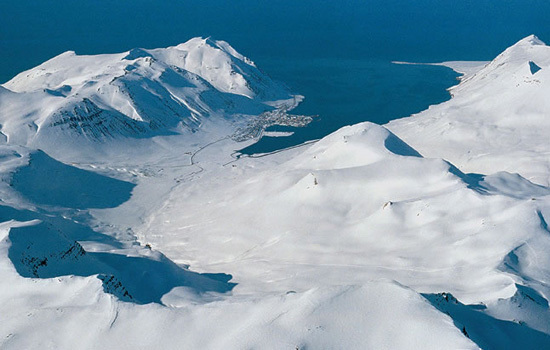 While the planning and construction of these defense structures were the work of a multi-disciplanary team, for our own purposes, we'll concentrate on the contributions of the landscape architects involved in the project, specifically the Reykjavík-based firm of Landslag. These anti-disaster tumuli were built in two phases. Completed in 1999, Phase I involved the construction of two deflecting dams on the south end of town. 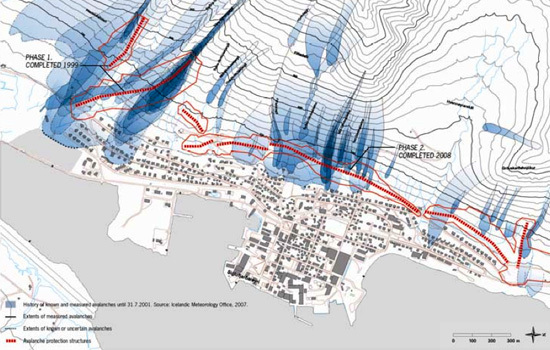 These direct avalanches from the most hazardous locations away from the populated area. The smaller of these dams, at 200m long and 15-16m high, is not as visible as the larger dam, which measures 700m long and 18m high and runs prominently up along the mountainside to an elevation of 180m. 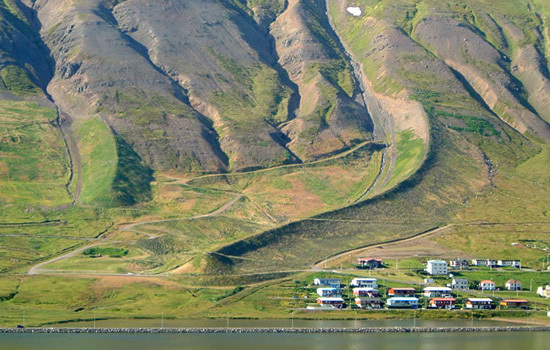 Completed in 2008, Phase II involved the construction of 6 walls and dikes running along the entire mountainward side of Siglufjörður. Unlike the two deflecting dams built in Phase 1, these are intended to stop the flow of an avalanche rather than change its course. During the early planning stages of the project, there were concerns about the negative social and even psychological impact of these massive landscape alterations on the town's residents, who, despite acknowledging their vital role in preventing fatalities and property damage, might nevertheless show strong resistance to such large-scale structures. This is where Landslag came in. Working closely with the engineers, geophysicists and meteorologists, Landslag focused on minimizing the visual impact of the project. Their solution was to approach the structures not only as fortifications against nature but also as an opportunity to create recreational spaces out of the defensive infrastructure. They were turned into an architectural statement, a positive cultural asset rather than an invasive structure. Since these gigantic structures could never be hidden, nor could they be camouflaged from view with tall-growing trees, turning them into landmarks was very logical. 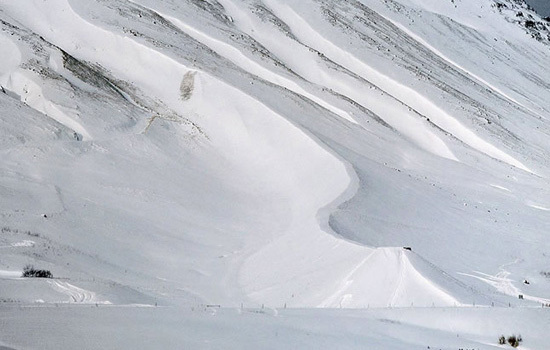 The avalanche defense structure, in fact, doubles as an outdoor recreational facility. 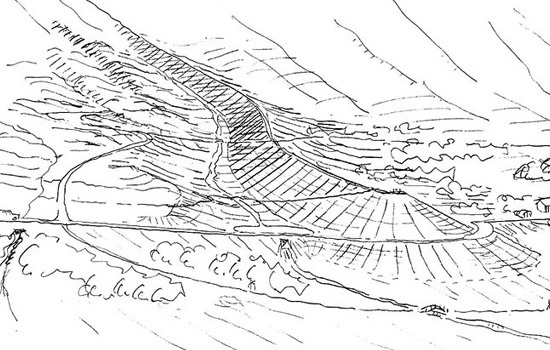 Paths weave around the structures and run on top along their ridge lines, directing hikers up the mountain. Already these trails are heavily used. At the end of the larger deflecting dam is a sloping bastion used as a public viewing platform. It's a hazard zone, but they're also occupiable. In order to avoid the deflecting walls from looking too dominating, they were designed to mimic the natural features of the surrounding landscapes. With the additional use of natural materials, their organic, undulating forms help to blend them into the landscape. To even further soften their substantial profiles, a process has been started which in decades to come will see the natural vegetation of the area reclaim and inhabit it once again. 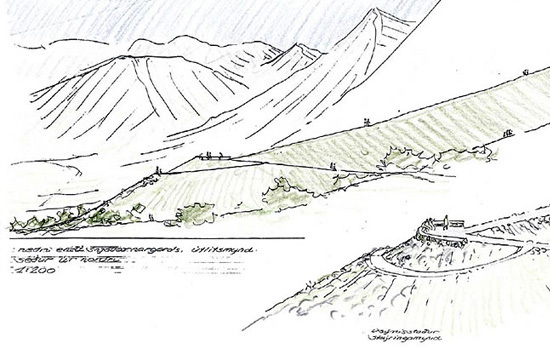 It is worth contrasting these with the avalanche protection structures at Drangagil Neskaupstaður and Flateyri, which look like they belong more to a Medieval walled city. 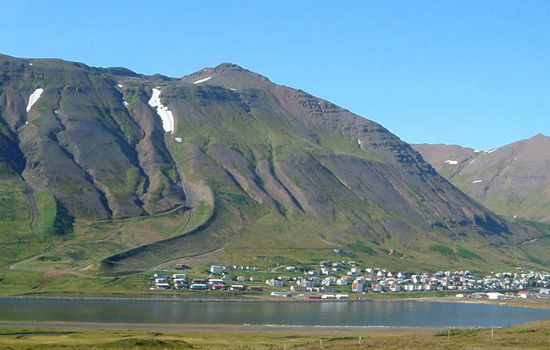 Yes, the protection structures designed by Landslag are prettier than those in Drangagil Neskaupstaður and Flateyri.